Great developer, interesting setting cant wait for the game to come out :D.
Does Flash dream of electric Romeo? Im pumped, i played The Witcher 1 like 4-5 years past its release and i was immensely suprised how well they made this game story/gameplay wise. I heard there were big problems with bugs, translations when it came out etc. But honestly they did immense job with story (a specially when you were accustomed to the universe, books, too bad they were mostly known in Poland/slavic countries). Well Garnek was chief storyline developer (or whatever the exact credit is) for both Witchers and I think he is one for CD Projekt RED in general. I'm pretty sure he is well accustomed with Cyberpunk 2020 as he as extensive background in tabeltop roleplaying games (he actually created one himself) You can't go wrong with that combination. Cyberpunk V.3 Was pretty crappy and that was the newest "remodel". 2020 was way more fun to play and had soooo many source books and a lot of lore that made it an awesome game (the system for playing was good as well). 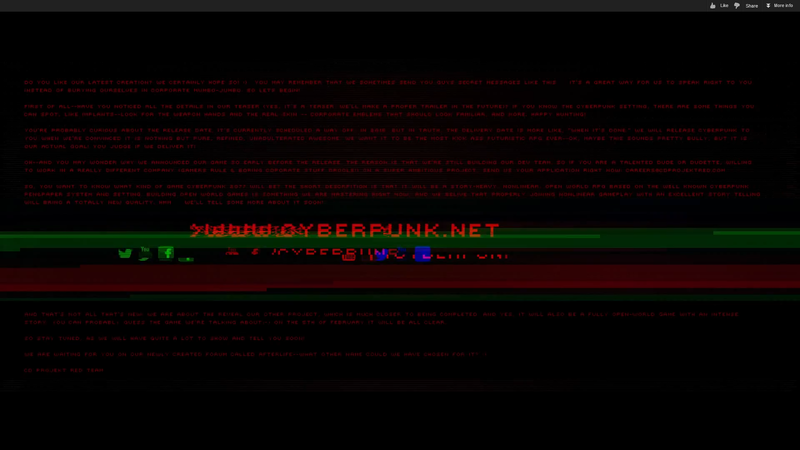 So my friends who were into Cyberpunk would have much rather played 2020 (a much much older game). Hopefully its good, but I don't seeing it being better than 2020 unless they plan on doing source books and really supporting it. If they keep the system similar to 2020 but do a little fine-tuning and ofc updating of the technology (which was already super advanced in the 2020 system) it could be good. V.3 tried to change way too much. There was a ccg that was based on 2020 that was amazing, but whoever owned the rights ran it into the ground before the 2nd expansion could come out. Most fun I ever had with a ccg and it basically had only 1 starting set (1st expansion was basically a reissue of the demo set with some more cards). Just to make sure, you know that this is a video game right? But yeah 2020 was awesome with the very little time I had with the pen and paper game! I believe CDPR stated somewhere that they are basind CP2077 on CP2013 and CP202 - they will ignore CP V.3. I don't know about Cybergeneration (sort of sidekick game) but I guess it will be ignored as well. It has a hidden message in first seconds which was already deciphered. "(...)all in the game, yo. All in the game"